Escape to our neighbours to the South with our last minute vacations to the United States. It’s quick and easy to plan a weekend escape, week-long getaway, or even a longer stay. Choose from countless interesting cities such as Washington, New York, Boston, Los Angeles, and more. Lounge on the beach at Myrtle Beach or visit the Windy City of Chicago. There’s so much to do and see you’re sure to have a blast no matter where you choose. If you have a destination in mind, our travel agents can recommend the best hotel for you. If you’re still deciding on a vacation spot, you may browse our Vacation Pricing Grid online to easily compare destinations and their rates or ask an agent for suggestions. Our hotels range from budget-friendly to luxurious. We can find you hotels in prime locations, close to attractions, airports, or points of interest. Whether you’re looking for romance or a family-friendly escape, there’s something for you! 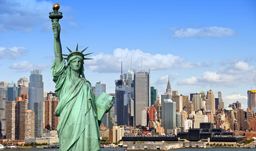 Call 1-800-665-4981 to learn more about our last minute vacations to the United States!